FOXSEW Sewing Machine Motor cover full range of sewing machine motors, like Brushless Energy Saving Servo Motor, Sewing Machines Servo Motors, Direct Drive Servo Motors, Clutch Motors , Induction Motors, Energy-saving motors, Mini Motors , etc…So, you can always get what you need here in FOXSEW Sewing machine motors house ! Clutch Motor and Energy-saving Motor are most popular models in the world market ! These models can bring high profit to our customers ! Clutch Motor is the most popular model in the world market. All the customers need Clutch Motor for the sewing machines. But we must realize that, the Energy-saving Motor will replace it in the future. As we all know nowadays, we must keep the environment, save energy, save power, so the Energy-saving motor can fit this requirements well. It has the smaller size, lighter weight, larger power, adjustable speed, easy operation, energy-saving merits. It is becoming more and more popular in the world market. In U.S.A, Canada, South Africa, Germany, Italy, UK, DUBAI, it is very popular and big quantity selling. It is the trends of the sewing machine motors ! 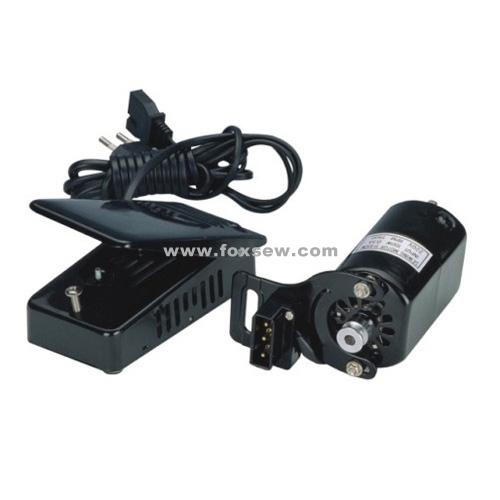 FOXSEW here provide the best sewing machine motors for the world, we want to do contribution for the world !